We'll be closed on Monday, Memorial day. Our hard-working staff sure could use the extra day off; this past week has been brutally busy. We'll try to get all the orders that come in over the weekend out on Tuesday. We hope you enjoy your long weekend. BTW, if your mean boss doesn't give you holidays off, you might drop us an e-mail. We're looking for another order packer/prototype tester/warehouse worker. It's an entry level job, but the benefits are good, the atmosphere is fun, and we always promote from within. 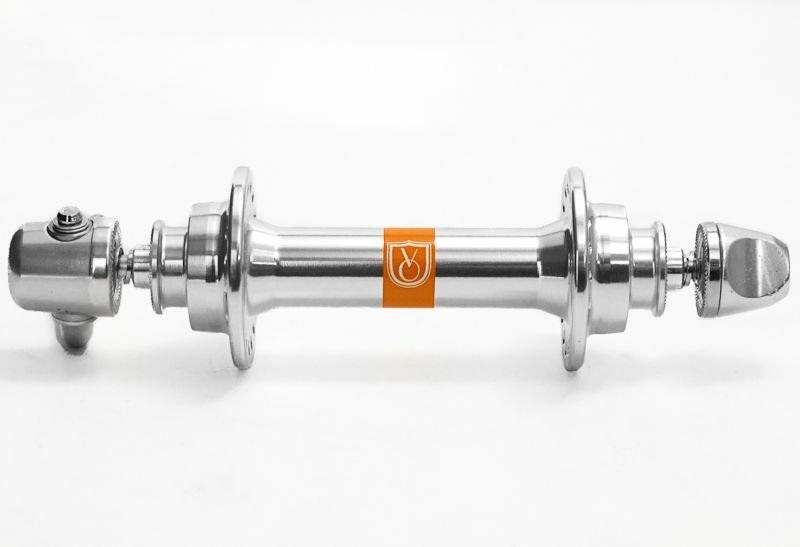 The Grand Cru fixed gear hubs have high quality Japanese sealed bearings. 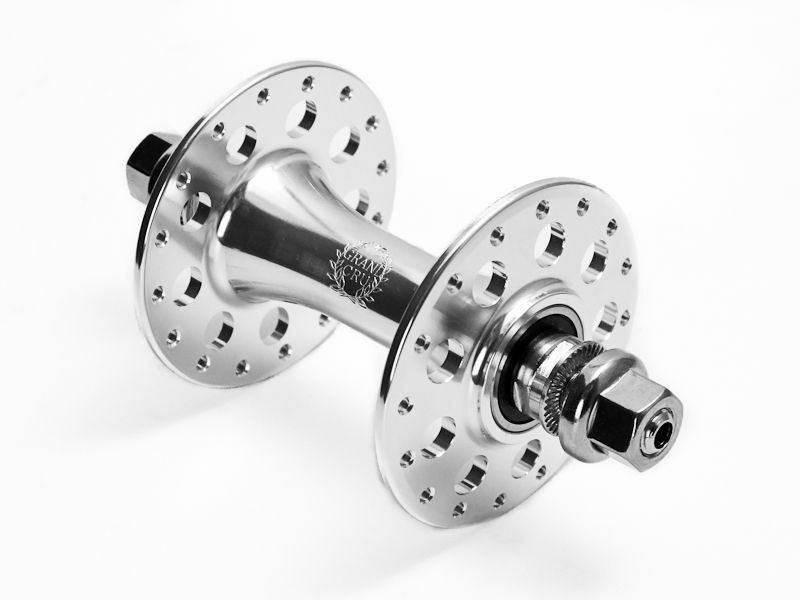 The axles are chrome plated for durability and hollow to save a little weight. Proper track nuts are included. 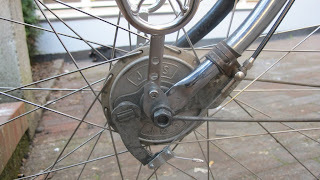 The rear hubs are "fixed" threaded on both sides. You can use a cog and lock ring or a freewheel on either or both sides. 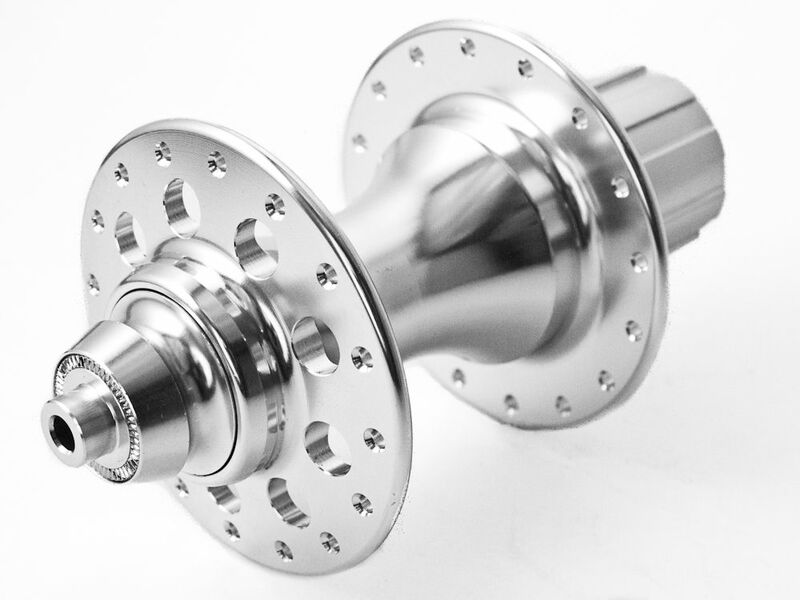 The rear hubs come spaced at 120mm, but include spacers to make them 126mm, 130mm, or 136mm. The front hubs are spaced at the standard 100mm. The Velo Orange high/low rear hub is a four bearing design with the same quality of Japanese bearings as the Grand Cru hubs. I just can't see how saving $20 by using cheap hub bearings makes any sense. The alloy cassette body has three large pawls and is well sealed. As with the Grand Cru high flange touring hubs, they can be disassembled without tools for cleaning or service. VO internal-cam quick releases are included. 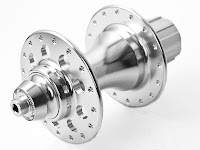 This is a great hub for those who want a lighter and slightly less expensive hub than the Grand Cru Touring hub, yet with bearings typically speced in hubs that cost twice as much. 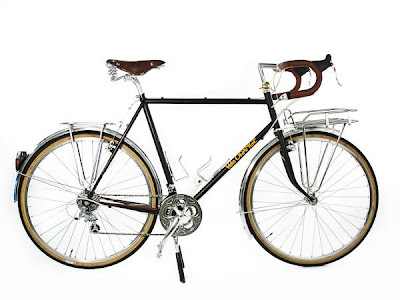 they would be great on a fast rando build, classic race bike, or pass hunter. 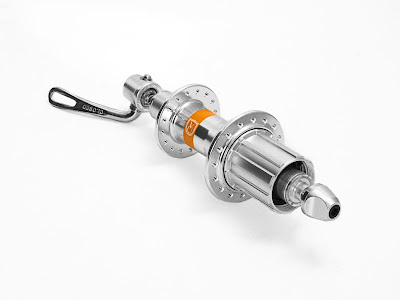 The Velo Orange low flange front hub is a good match for the high/low. 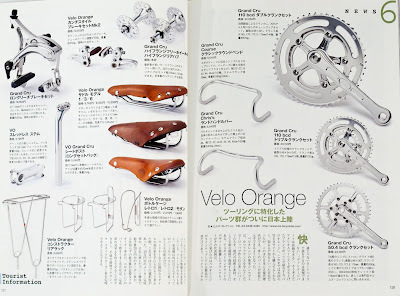 It also has Japanese bearings and includes a VO internal-cam quick release. 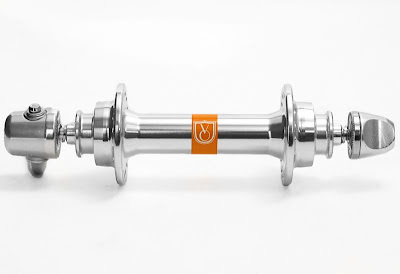 The VO hubs are also available as a set, which saves you a few dollars. 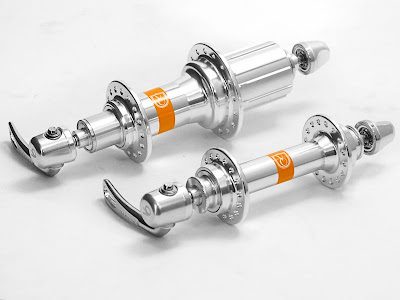 The Grand Cru high flange touring hubs have been delayed by a few days, but will be here soon. 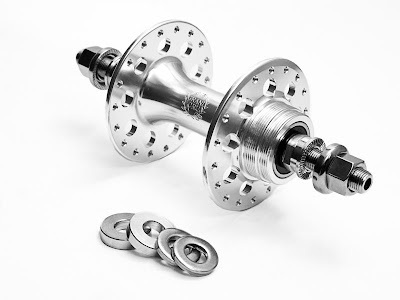 We'll be building wheels based on these hubs and our rims soon. Are there any particular combinations you'd like to see? The choices of high quality quill stems has been getting a little thin these past few years. We received three new models today. More choice is good? It may look like a $450 fillet brazed stem from a custom frame builder, but the Grand Cru stems are actually made using a custom one piece steel quill and extension. The clamp is welded onto the extension and the weld is hand filed smooth on top. This results in a strong, yet relatively light, stem with a classic shape. This stem took a tremendous amount of time and energy to develop, but I think it was worth the effort. 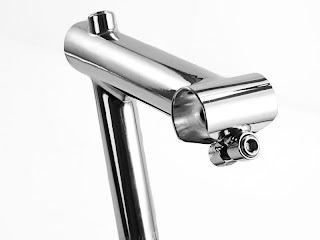 Here is a less expensive chrome stem with positive rise. 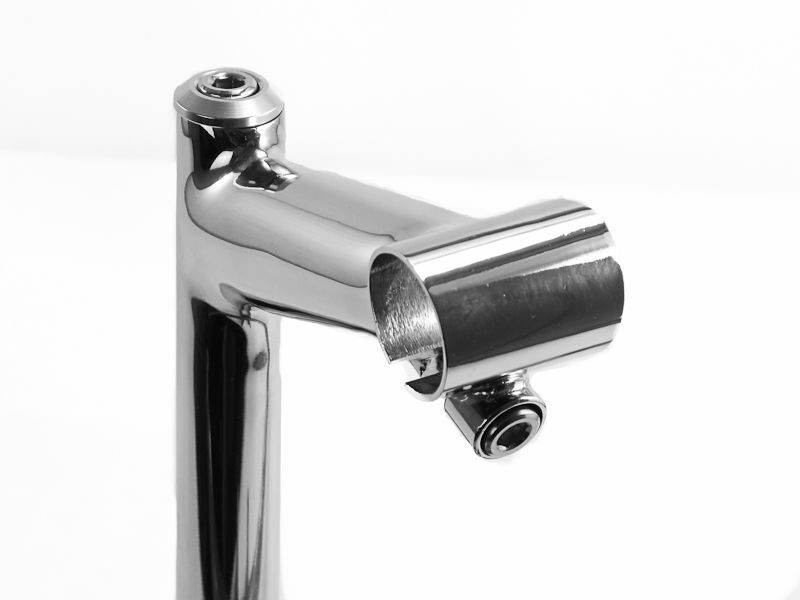 The VO Quill Stem is a smooth welded chrome plated 1" quill stem. It has a 17-degree positive rise. Total quill length is 190mm or 120mm above the min. insert line. 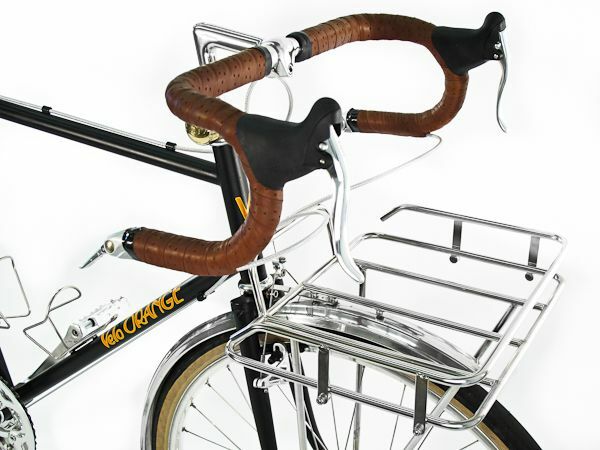 (Interestingly, it will get your bars as high as a Technomic stem, yet it weighs a little less.) 26mm clamp. Alloy wedge. Weight is 367g for the 100mm size. The ENE traditional alloy quill stem is another high quality addition Dia Compe's growing line of ENE classic components. It's nicely polished and displays small logos. 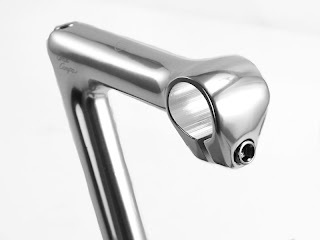 A good choice for those who like an alloy stem, but don't need the extra quill length and extra weight of a Technomic. They are currently only made in 80mm amd 100mm extensions, but we will stock more sizes as they become available. 180mm total height, 115mm above the min. insert line. 26.0mm clamp. Alloy wedge. Weight is 340g for the100mm size. Less than a week working at VO and I already wanted to taste the 650b nectar. I have been riding larger tires for quite some time, but while touring the tires I ride weigh more than some modern racing frames and I have come to realize that at some point in tire size, bigger is not necessarily better. Having settled into town, I opted for a lighter, faster tire; something that would race around town a bit, then take me out to the country with greater ease and enjoyment. The list is short for quality, medium volume tires that would fit my 1985 Schwinn High Sierra or my girlfriend‘s Surly LHT; both are 26” bikes with drops and touring equipment. I saddled up on a pair of 38mm Panaracer T-Serv tires, and was immediately underwhelmed by the ride of small wheels and smaller tires. The workshop at VO is full of treasures, and I found a pair of space-age cantilever brakes (the next version of the Grand Cru) that I wanted to test. Upon mounting them, I realized that they had a lot of vertical adjustment…some quick calculations and a few minutes later there was a 650b wheel mounted in my frame with the brakes adjusted at the top of their range. The thought of finally riding high-quality, larger volume tires seemed heaven-sent. Road bikes have many high quality tires to choose from, although they are mostly too narrow for my needs. My mountain bike frame is happy with many tough, long-wearing road touring/commuting tires, but the ride quality of even the best options is a bit uninspired. The magic of 650b, I realized was the option to ride lightweight, high-quality tires with reasonable air volume like the Pacenti Neo-Moto without undersized or oversized wheel dimensions. In short, I didn’t have to choose anymore-- I could ride nice, big tires. I mounted a pair of Pacenti Pari-Moto tires and was immediately hooked. The volume of the tire, the supple casing, and lightweight (less than 300g) made for the most lively ride I’ve ever experienced. With the 650b Pari-Moto, my wheel is the same size as my previous touring wheel, thus, the bike handled in a more familiar way than it did with the undersized Panaracer T-serv tires. In an effort to deshroud the mystery of wheel/tire size, I calculated that the 26 x 1.75 (653mm…650!) wheel I had been riding had nearly the same nominal outside diameter as the most common 650b tire sizes (38/650b results in a 660mm wheel). I had been riding this wheel size all along, only the details of rim and tire size had changed. This approximate dimension is also shared by narrow high pressure road tires, whose outside dimension with 700c/23mm tires is 668mm.. The discussion of ideal wheel sizes is overstated I discovered, as they are all nearly the same. It is by selection of a tire size to suit your riding needs that a specific rim dimension becomes relevant. If you wish to ride tires under 32mm, 700c works well as there as more than a few tires to choose from. For tires over 42mm, 26” is a good place to be. But if you want the dreamy, quick and comfortable ride on high quality, larger volume tires between 32-42mm, 650b is where it’s at. 26“ to 650b conversion details: Most classic mountain bikes and some popular modern offerings such as the Surly LHT (26”) have adequate clearance for all of the smooth tread 650b tires. A 650b/38mm wheel actually suits the dimensions of the LHT better than a narrow 26”/32-38mm wheel, which leaves gaping clearances and unfamiliar handling. Conversion simply relies on a brake with 12.5 mm of vertical adjustability (half the 25mm difference between 559 and 584). We have already identified that Tektro CR720 brakes work at the top of their range, as did a prototype Grand Cru brake hanging out in our shop. 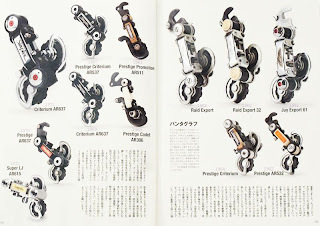 Of course there are a few v-brake designs that have been around since the 90’s with loads of vertical adjustment as well. Since diving into bike touring three years ago, Lael and I have toured around much of the US, including trips on both coasts (three times on the west coast). Three months in France early last spring allowed us ample time to travel the countryside, from our home in St. Malo, Brittany to Chamonix-Mt. Blanc and back, among many shorter regional trips. This past winter we biked south from Seattle and down the Baja Peninsula, then sailed to the mainland and rode into the Sierra Madre to the Copper Canyon. We have lived and worked seasonally in St. Malo, FR, Denali, AK and finally in Key West, FL where we worked as pedicab drivers for several months to escape the northern winter. "Today's feat, however, can't go unacknowledged, as the weird convergence of customer loyalty and warehouse accuracy will likely never be repeated. One of our customers has placed his 50th order. Amazingly, we have never messed up a single order of his..."
One and half years later, a second customer has gained membership in the VO Free Shipping Forever club, despite our messing up at least one of those orders. Strangely, the relationship between us and the first club member continues to be defined by weird convergence: his latest order was number 100010000. Thanks to both for sticking with us through thick, thin, and 100010000. Kyle shows us how to disassemble the Grand Cru Touring Hub, a VO Cinema Presentation, photographed and directed by Alec Burney. Grand Cru 4 Bearing Hub from Alec Burney on Vimeo. 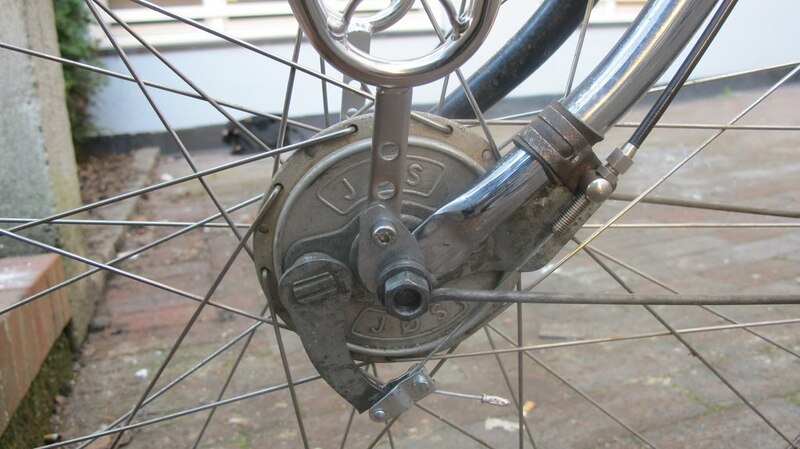 Consider how easy it will be to service the hubs or change spokes while on the road. 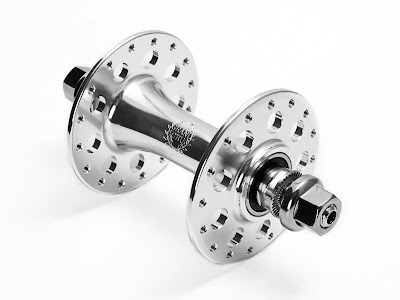 These hubs should arrive in about two weeks. Here is another nice bit of press about VO. It's a two page spread in a lovely Japanese magazine called Cyclo Tourist. 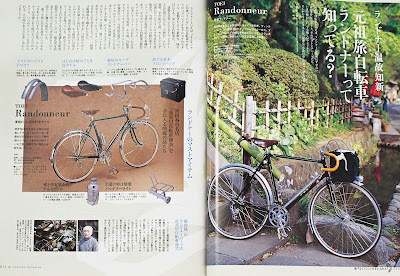 Thanks to Kentaro-san of M's Bicyclette for sending this along. This past year we've seen a lot of growth in the Japanese market. 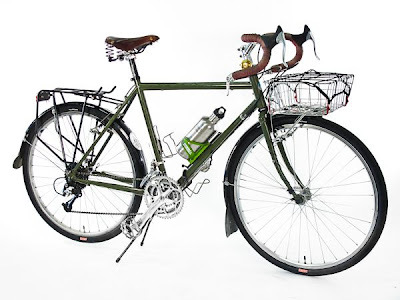 "Easily the most versatile bike out of dozens tested, the chromoly Polyvalent handles like a dream on long city voyages with as much as 40 pounds on the front rack"
Unfortunately we are currently out of the very popular Polyvalents. 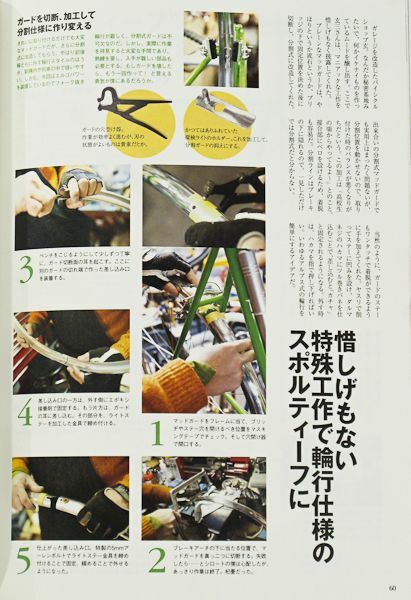 Our work on the redesigned fork delayed production by almost 4 months and we ran out of frames. I'm pressing the factory for an accurate delivery date and will post it as soon as we know. We are also looking into a pre-ordering system, but I'm not sure this is a good idea since frames seem never to arrive on schedule. We'll offer the mini-build kits again when the new frames arrive, but we are also considering offering full-build kits, maybe even complete bikes. Larger diameter down tube to make the frame a little stiffer because lots of folks are carrying really big loads on Polyvalents. Note: Due to a Blogger glitch last night the comments to this post (and to posts on thousands of other blogs) seem to have been lost. I can't recover them, so please leave your comment again, if you like. Up to now Blogger has been 100% reliable and maybe they can recover the comments. In case you missed the tweet, Thomas Armstrong of the 70.8% blog posted an interview with some guy who's been in the boat and bike biz. 70.8% is actually a great blog that I've been reading for awhile. The interview with Steve Roberts, a couple of posts down is also worth reading. Check out the photo of his bike, named Behemoth. There is a Twitter feed on the right side of this blog. I use it to occasionally post miscellaneous bits of information and links. I only mention this because a few folks have told me that they don't see it in their browsers, and a couple just didn't notice it was there. So they missed fascinating bits of news such as an article that explains studies showing that UV light can make you faster and stronger. Here is the direct link. 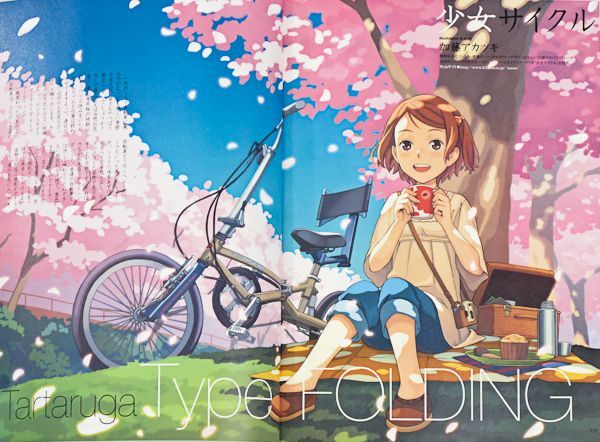 There is also an official VO twitter. We are starting work on a Mark 3 version of the Grand Cru Canti brakes. 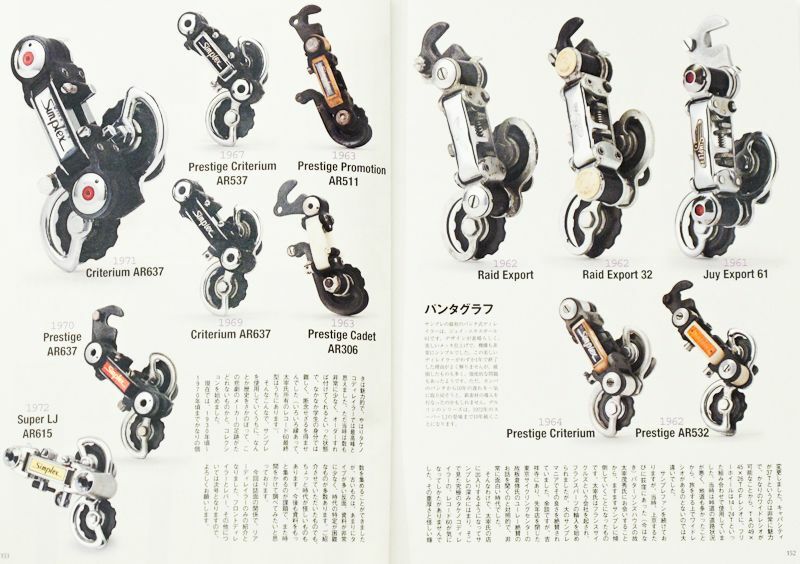 They will have an lengthened lever arm for more stopping power. Additionally, there is enough up-and-down pad adjustment to convert 26" mountain and touring bikes to 650b. With them you could use 650b wheels on your LHT or classic Stump Jumper and have access to all those wide soft tires, like the great Pari-Motos, with minimal rolling resistance. The Mark 3 brakes were not designed with conversions in mind; we simply discovered an added benefit to the longer adjusting slots. I expect that taking an old mountain bike and having the fork re-raked might make an acceptable low-trail 650b touring bike. Re-raking is fast and easy and can be done without damaging the paint. Anyone have more experience with this? BTW, these brakes will be an additional model, not a replacement for the Mark 2. Speaking of touring bikes, the 700c Polyvalent will officially be in the prototype stage next week. That means that we will be waiting for prototypes instead of just second-guessing all the details we put on paper (actually CAD). The main changes from the 650b Polyvalent are, vertical dropouts, slightly shorter top tube, longer chain stays, 3 sets of bottle cage bosses, and more rack mounts. Now we need to pick a color. Blue-gray? Dark gray? Custard? We often get asked if the Porteur rack will accept panniers. Yes; the rack works perfectly with most panniers. 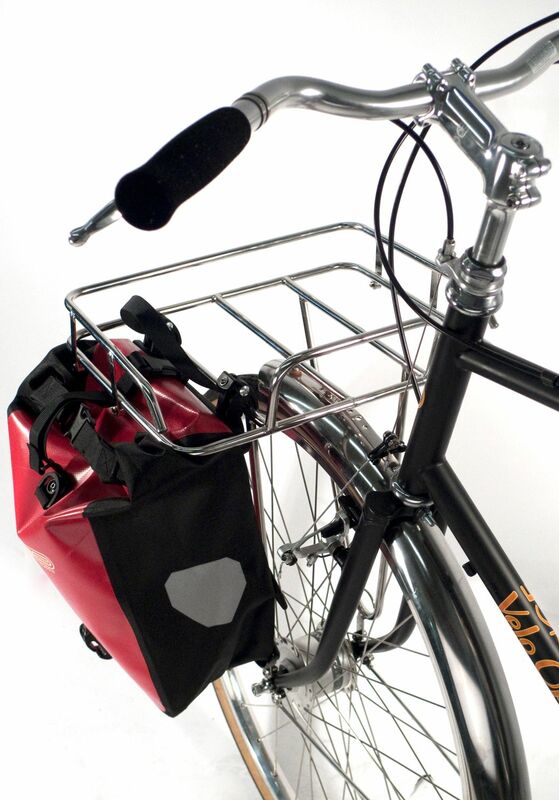 I like to hook panniers on the inner rails, as in the photo. They can also be attached to the outer rail, but then they lean outward which looks odd to me. 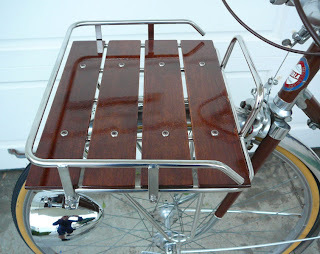 Bjorn made a neat adapter to mount a Porteur Rack on his 1948 bicycle. Check out the post about it on his blog, The Accidental Hermit. The rest of his blog is pretty interesting too. 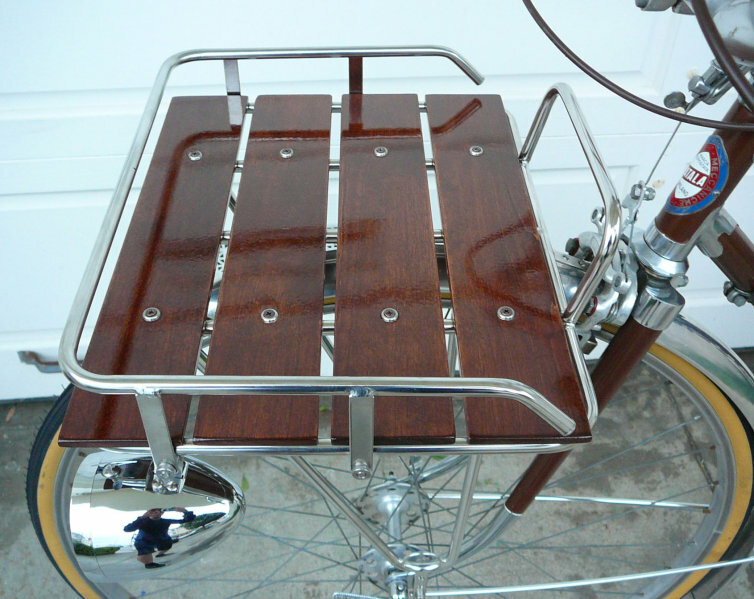 Chris makes slats for VO Porteur racks. They really look nice. He also has a lovely old Atala. We get a lot of e-mails from folks saying they really like the Porteur Rack, probably more than about any other product. I wonder if we should also make a bigger version? We went kayaking yesterday in our folding kayaks. What does this have to do with bikes? Nothing except that I've notice that people who use, and travel with, folding kayaks are a lot like bike tourists, and many do both. And I though at least a few readers might like to know about them. We've owned two folding kayaks for about 15 years. And in that time we've used them in British Colombia, the San Juan Islands, Lake Powell, along the Maine coast, in Nova Scotia, in the Florida Everglades, and in dozens of other lovely spots. Some times we camp, carrying all our gear. Other times we stay at inns and take day trips. And because the kayaks fold into a few neat canvas bags, we check them as airline baggage and transport them in a rental car. Once on the beach the wooden frame and canvas/hypalon skin can be assembled in about 15 minutes. Sea kayak touring has a lot in common with bike touring. You move along at a moderate pace with minimal of effort and enjoy the scenery. You can carry more than you would on a bike. And, so long as you are careful of weather and surf landings (avoid them) it's very safe. 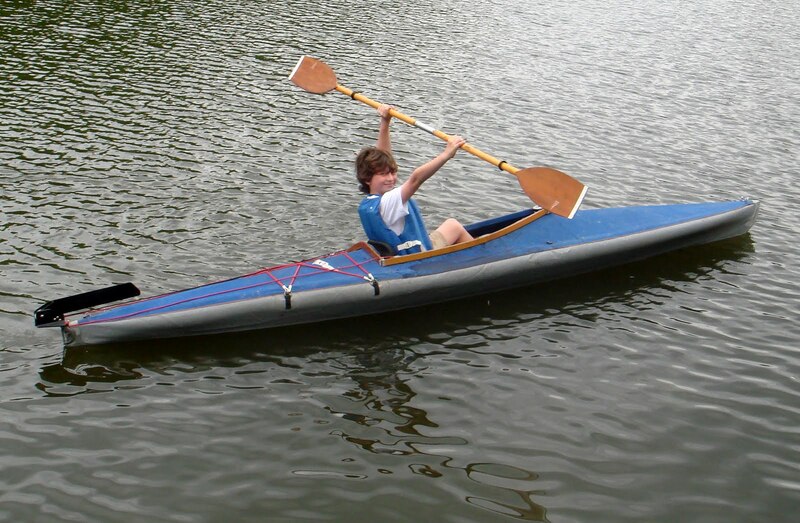 The brand of kayaks I like are Kleppers, which are made in Germany and known for their ruggedness and quality. 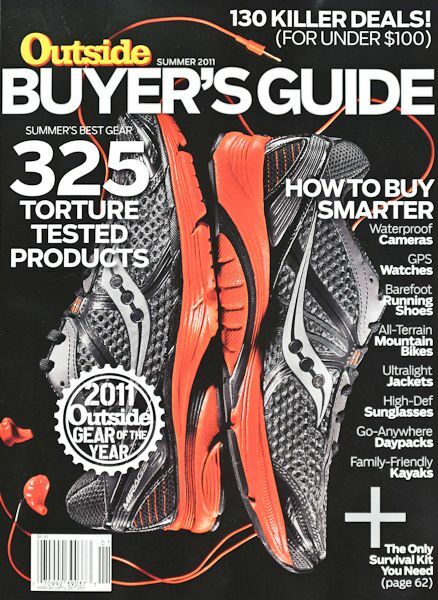 They are the choice of many expeditions to remote regions. At least one has sailed across the Atlantic; yes, they can be rigged with small sails. They are also used by many military "commando teams", assembled on the deck of a submarine and paddled in under cover of darkness. There are several other good brands that are less expensive, lighter, and maybe a better choice for casual use. 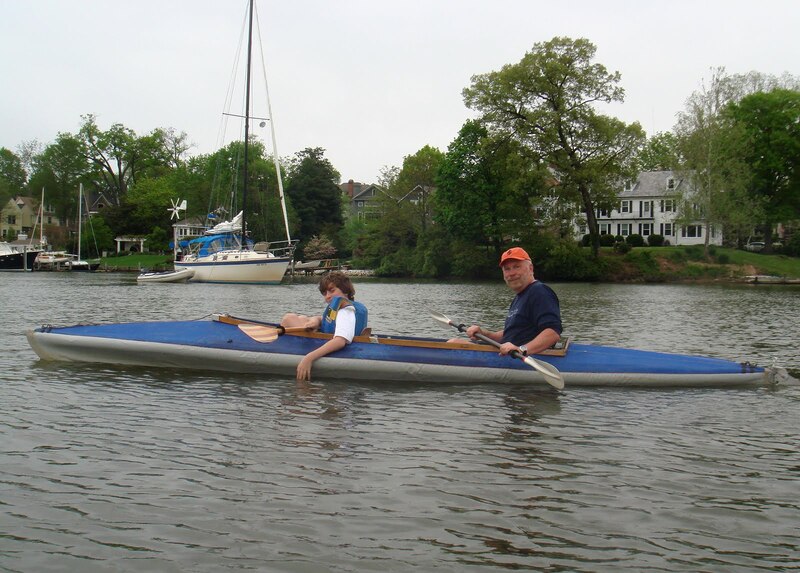 I've used and liked Feathercraft, Folboat, and Pouch folding kayaks. The French Nautiraid kayaks also have an excellent reputation. Sadly, Sunday was probably our last paddle in the Kleppers. Our son wants a sit-on-top kayak for fishing and snorkeling and one that's small enough that he can wheel it down to the launch point a few blocks from our house (using a kayak cart). And with VO taking so much time we don't use the Kleppers often. So we decided to sell them and get smaller roto-molded plastic boats. When he is older I hope he wants a folder. 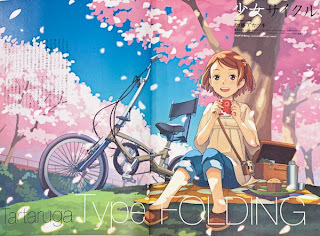 Next post will be about bike stuff. But meanwhile do any readers sea kayak?